Former court rooms in Warwick could soon be getting a revamp to become an events venue. The Old Shire Hall and Judges’ House, in Northgate Street, was used by the judiciary since the 1750s. The Grade I-listed building has been mainly unused except for civic and ceremonial events since the courts moved to Leamington in 2010. In April 2016 Warwickshire County Council agreed to set up a hospitality company, which will operate as an ‘arms length’ company for events and venue management over 10 years. 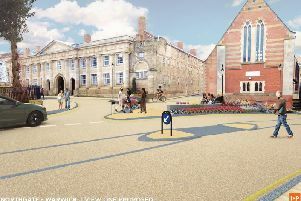 Plans for the Old Shire Hall have now been drawn up and submitted to Warwick District Council planners. The building consists of a great hall, which can be used for larger functions such as weddings, three courtrooms, cells and a Judges’ House, which is made up of dining and drawing rooms, which could be used for drinks receptions. The proposed work for the building includes replacing, adding and removing doors on both floors, installing toilets, increasing ventilation in the great hall and adding acoustic curtains to reduce noise levels during events. There are planned works to help modify the building so that it can be used for weddings, such as transforming the rear gate and garage next to the Judges’ House to provide an entrance for brides. Another addition includes the proposed installation and use of CCTV. According to planning documents, Warwickshire Police have been consulted on where the cameras would be best placed. They recommended installing nine cameras around the building. The plans will be considered by Warwick Town Council at a planning meeting on Monday.